The “Eyes on Owls” live owl presentation is at 7:00pm on Friday, November 16, 2018 at Littleton High School. This event follows LCT’s annual meeting. You do not have to attend the annual meeting to attend Eyes on Owls. The meeting and presentation are free, open to all and accessible. Light refreshments will be served. This event is appropriate for ages 5 through adult. Field naturalist Marcia Wilson and wildlife photojournalist Mark Wilson return with the ever popular Eyes On Owls program. 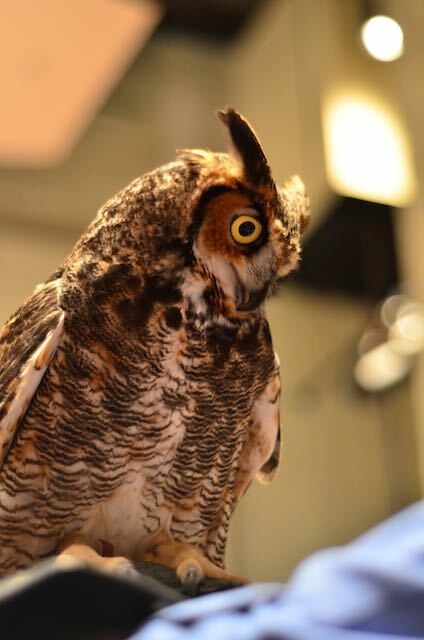 They will display six lively owls separately and walk them around the audience for close-views, photos, and questions. Preceding will be a short informative slide presentation and a rousing “hooting lesson” with audience participation. Mark and Marcia Wilson will share their knowledge of field marks, signs, and naturalist skills that you can use to find wild owls, without disturbing them, while introducing you to six live owls up close! See www.EyesOnOwls.com for more details on this program.